Since 1989 Fellow Earthlings' Wildlife Center, Inc., has been dedicated to providing life-long homes to orphaned, old, sick, injured, or homeless meerkats. All the special creatures that live at the Center depend on us for their safety, food, shelter, and quality of life. We, in turn, depend on you, the donor, to help fund our facility so we can provide the animals with the best possible care. Our facility has no paid staff. When you contribute to Fellow Earthlings' Wildlife Center you have our promise that 100% of your donation goes directly to the animals or to the projects that benefit the animals. Also, since we are a government authorized 501(C)3 non-profit organization, your donations are fully tax deductible. We will send a receipt for your records for donations $250.00 and over. Furthermore, you may specify where you want your donation to be directed -- to the meerkats, or to one of our special projects that directly benefits the animals. For more information about our special projects, please read our online newsletter PAW PRINTS. Toys and activities that provide physical and mental stimulation. It's only with your support that we can continue to expand our work. With your donation, you become a member of our family circle. You will receive online newsletters that give you detailed information about the animals, our accomplishments, and our future goals. We hope to show our appreciation to you in many ways. Perhaps, the best way is to provide the animals we all love with the best care possible. Together we can! On behalf of all our precious animals, we thank you! Please note: While meerkats are adorable and captivating, they do not make good pets. 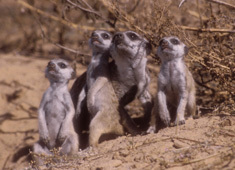 Surprisingly, meerkats are one of the most strictly regulated animals in the world. They are illegal to own without the proper licenses and permits. Of course, all "adopted" meerkats remain living at Fellow Earthlings' Wildlife Center, Inc.